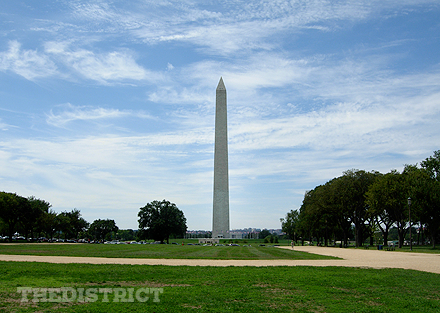 At 555 feet, 5.5 inches, the Washington Monument is the tallest stone structure in the world. It is also the tallest structure of any kind in Washington, D.C., meaning that at some point during your visit — after the fifteenth or twentieth glimpse of it from a lot farther away than you’d have guessed you could see it — you’re bound to start wondering what the city looks like from the windows at its top. The answer is: it looks stunning. On a clear day you can see 20 miles, but even on a muggy day you’ll see far enough to appreciate Pierre L’Enfant’s boulevard-and-circle vision of city design, and to take in the way the Potomac sweeps to the south of Capitol Hill. To the north you can look into the White House’s backyard. To the west lie the Reflecting Pool and the Lincoln Memorial; to the south, the Tidal Basin and the Jefferson Memorial; to the east, the whole length of the National Mall, all the buildings of the Smithsonian, and the U.S. Capitol. Around its base flutter fifty American flags, one for each state. Although it is now the most iconic landmark in Washington, D.C., the Washington Monument sat unfinished for an astonishingly long time. Congress first formed a Washington National Monument Society to raise funds for it in 1833, but bad fundraising, interference by the American Party (also called the Know-Nothings), and the Civil War conspired to leave it stalled as a hundred-foot stump for 50 years. Interest in completing the monument revived with the first Centennial in 1876. Congress appropriated the money necessary to finish it, and the capstone was finally put in place in 1884. When the Washington Monument is open, more than 800,000 people visit the Monument each year — meaning that there’s often a line. You can pick up free, timed, same-day tickets at the Washington Monument Lodge, located along 15th Street, starting at 8:30 a.m. 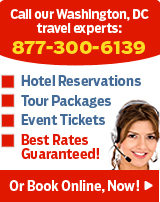 But be warned: during peak tourist season tickets run out quickly, and the line forms as early as 7 a.m. A better plan may be to reserve tickets through the National Park Service ticket web site, or by calling 1.877.444.6777, for a reservation fee. 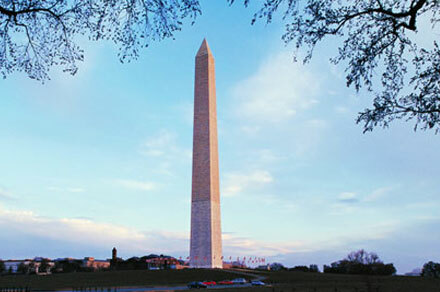 The Washington Monument is closed until spring 2019, while the National Park Service modernizes the elevator to increase long term reliability and safety. Hours: Open year round 7 days a week from 9:00 am until 5:00 pm (last available tour ticket at 4:00 pm), except for July 4th and December 25th. Parking: Limited parking is available along Ohio Drive, SW, between the Lincoln and Thomas Jefferson Memorials. Limited three-hour parking is available on Jefferson and Madison Drives; metered parking is available on Independence Avenue. Metrorail: Blue and Orange Line stops for Smithsonian; walk two blocks west on Independence Avenue.